Even though it is the middle of summer, at least here in the northern hemisphere, we are diving deep into the coldest and farthest depths of the ocean in this issue of Hydro International. In the season where most of the activity is on and beside the water, we look at those initiatives that find solutions to mapping those vast areas of seafloor that have not been mapped before. The mapping will be done mainly through the fast developing technology of unmanned systems, of many different types. Why should we want to map all those immense pieces of underwater land, at times as large as entire nations? So far we’ve managed safely without the knowledge of what is down there at the bottom of sea. The chairman of The Nippon Foundation, Mr Yohei Sasakawa, said recently at the UN Oceans conference in New York that ‘understanding the bathymetry of the global ocean is imperative, not only for improving maritime navigation, but also for enhancing our ability to project climate change and monitor maritime biodiversity and resources.’ As chairman of the Nippon Foundation he launched the NF-GEBCO Seabed 2030 as a joint project of the Nippon Foundation and the General Bathymetric Chart of the Oceans (GEBCO). It was announced In New York that the Nippon Foundation is willing to contribute USD 18.5 million for the first ten years of the project. That money will be used to compile a high-quality, high-resolution digital model of the ocean floor combing all available and newly collected bathymetric data. In the meantime, the GEBCO Alumni team is entering the semi-final stage of the Shell Ocean Discovery XPRIZE. During this competition that runs over the course of 36 months, ending in December 2018, teams from all over the spectrum are developing and testing technology that will be able to help towards the same goal of Seabed 2030. The team consists of GEBCO fellows from all parts of the world. Kongsberg Maritime offers technological support to the GEBCO team while they pursue their goal of winning the Shell Ocean Discovery XPRIZE. In this issue of Hydro International on Unmanned Systems we interviewed Richard Mills, of the section Marine Robotics of Kongsberg Maritime and Arne Kjorsvik, CEO Eelume AS. Eelume is a start-up company and Kongsberg Maritime one of the giants in underwater technology. The two companies are working together on the Eelume, a snake-like underwater robot that can live permanently on the seafloor and because of its shape and flexibility will be ready to go to those places that are difficult to reach. 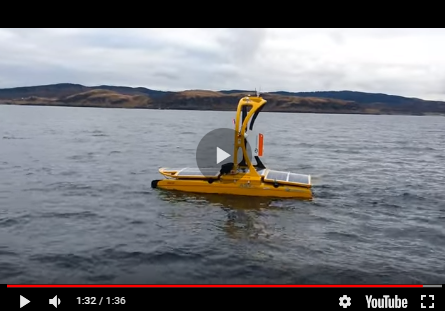 Not specifically aimed at the depths that the technology developed in the XPRIZE is going to, it is still a strong sign that this trend of building more versatile, flexible and robust technology to map the underwater world is only growing stronger. Not just because it is possible, but moreover because it is necessary to go to all depths to save the planet, its oceans and the life in and around it!